Group D looks tough. Argentina will look to Lionel Messi for the inspiration, creativity and goals to advance but the side defensively look vulnerable when you consider that Croatia, Iceland and Nigeria are group opponents. Hawkeye Sidekick reflects on the squads. Jorge Sampaoli has a delicate balancing act to achieve with this Argentinian squad loaded with attacking talent in striker and midfield positions but unfortunately there are questions on how defensively solid the side are with this talent in the side. The friendly loss to Spain at the start of this year was evidence if evidence was needed that Argentina defensively as a team is a work in progress and whether Sampaoli can fix this during training camp is ambitious at best. The pros for the side are the attacking talent options. Aguero, Messi, Dybala, Di Maria, and Higuain are incredible options to have. How Sampaoli keeps these players happy with sufficient game minutes to partner the mercurial Messi is the another fine balancing act required? Plenty of defensive leadership and responsibility is going to rest on the likes of Mascherano and Otamendi. They will need support from their central midfield area with the likes of Biglia will need to be on point in their defensive duties. Banega is another player who could have a positive impact for Argentina in this tournament. The lack of defensive nous collectively in the team is going to give group opposition an opportunity in these opening round fixtures. Argentina to just sneak into the second round but this opening round will see vulnerabilities in this Argentinian side which a potential last sixteen side will gleefully accept despite the brilliance of Messi. A team of the sum of all its parts. The many years of cultivating a well run, efficient youth development system to unearth Icelandic talent has reaped its rewards. Iceland feature in yet another marquee tournament. Their support and the trademark hand clap will be greatly appreciated from the World Cup organizers. The pluses for the side is their organization; hard to break down defensively and well organized. Their ability to execute superb set piece delivery led by Gylfi Sigurrdson and Johann Berg Gudmunson has created numerous goals and will be a live threat to all opponents. Their ability to go direct plays to the strengths of their forward line options such as Finbogason. The negatives for the side are that they will be up against potentially at least two of the most potent attacking units in the tournament. Argentina’s attacking arsenal and their electric pace will test Iceland’s rearguard who at times have struggled to contain pacy attacking sides; elude to France quarter final loss in the UEFA Championships. The personnel has not changed drastically from this encounter. Croatia have the potential to pass a team into exhaustion. Iceland will need to realistically get something from the Argentina and Croatia games to have a realistic chance of advancing to the second round. Can Iceland evolve their game plan to throw different looks to their opposition? I have my doubts and I think they will at times look incredibly one dimensional. Alas, Iceland to go out in the opening round of the tournament. A team which should get to the semi-finals of this tournament. They are an incredible solid squad; defensively solid and with marquee midfield and attacking options to cause endless issues to opponents in this campaign. The pros for the side are the midfield options. Luka Modric has the ability to beat teams on his own; his ability to change tempo when required, his passing range and ability to come up with decisive goals from long range are huge pluses. Mateo Kovacic has the ability to be a player of the tournament. The Real Madrid central midfielder ticks all the boxes; good with the ball, defensively on point and ability to support his strikers with searing runs from deep. Ivan Perisic, Nikola Kalinic and Mario Mandzukic are quality front men and offer pace, power and aerlal threat for the national side. Mandzukic in particular has had another terrific season with Juventus at club level and if provided with good service, will be scoring plenty. If there is a negative, it can be that Croatia can at times take their foot off the pedal during a fixture. It cost them during the European Champions and the qualification saw a couple of indifferent end of campaign results due to complacency during the game. 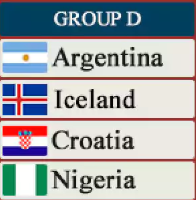 I would be disappointed for Croatia if they cannot emerge from this group as winners. They are the standout team in this group; experience and no genuine weak links in the squad. Their passing game has the potential to destroy teams in this group. Group winners for me. The African nation is known for its pace and powerful football. From their cameos in USA ’94 where the likes of Finidi George became a household name to the footballing world, this side have not being afraid to express themselves on a football pitch. There have being years of turmoil between the association and players but this is all behind the country as they look forward to this tournament. The side have experience straight down the spine of their side with the likes of Obi Mikel, Moses, Musa, Etebo, Ndidi, Iwobi and Ighalo. They have pace and power to exploit teams on the counter attack which could cause issues for their pool opponents. The negative is in the defensive squad depth. The goalkeeping position in particular is quite inexperienced with Ezenwa with only twenty-six caps, the other keepers have only a handful caps between them. The defensive options are for me personally something of an unknown and I fear that the team may be prone to a couple of defensive lapses which will cause decisive goals being conceded. Entertaining football is the objective but whether defensively they can be solid enough is a big question mark and for this reason, it looks like an opening round exit. An interesting group on paper. 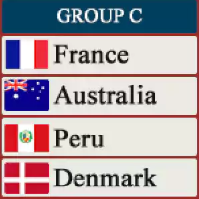 A group where France, Denmark, Australia and Peru will lock horns. A group where France should be the clear favorite to top the pool but the other three teams will pose different looks which makes this group an intriguing one to predict. The squad is loaded with depth and talent in all positions. Lloris, Varane, Umiti, Pogba, Kante and Griezmann to name but a few of the star studded squad assembled for Le Bleu. The key point is the harmony between management and players as in tournaments past, all has not being so rosy in the French camp leading and during major tournaments, look no further than the South African World Cup when the French side under-performed and infighting in the camp was rife. A nice group for France to evaluate their chances of World Cup success starts with a fixture against Australia. The Danish fixture potentially is the game to decide top spot. Hoping France produce a high tempo game plan where the likes of Lemar revel out wide to supply the likes of Griezmann who will look to end speculation om his club future with an TV cameo in Spain tonight. France personally are another dark horse in this tournament; their speed and pace is a live threat for anyone if the team are in the mood. They will top this group with a bit to spare. The Danish challenge needs to be respected. Their performance in their second leg playoff demolition of the Republic of Ireland was evidence that given the time and space, they will punish teams. The team is centered around Christian Eriksen, the mercurial midfielder looks destined to have an excellent tournament. His passing range, ability to create chances for colleagues and to score goals from runs from deep or long range efforts is the standout threat. Delaney as well fresh from his transfer to Borussia Dortmund can also contribute from a midfield perspective. The team is defensively solid with the likes of Schmeichel, Christensen and Kjaer in the ranks. The issue for Denmark is if teams target Eriksen, what is the alternative Plan B. There were indifferent performances in the qualification phase of play when teams flooded the midfield area and nullified Eriksen’s influence as a result. Their fixture against Peru who will be cagey and defensive will test Denmark’s patience and nerve to keep composed. If they can win their opening fixture, they are primed to qualify for the second round but France personally have too much in squad depth for this group of players. The case of Paolo Guerrero has captivated all World Cup preparations for Peru. The inspirational Peru captain is now free to play in the tournament and is a timely boost for a team who will need goals to advance from this group. They have live threats upfront with Farfan and now the available Guerrero but question marks abound on the midfield creativity of the side. Peru will look to play on the counter in these pool games and if teams do not respect Peru’s pace on the counter attack could get caught out. A potential star for Peru in the engine room of midfield is Tapia, a versatile player who plays in midfield for Feyenoord but can also play full back and center half as well. Peru’s inability to supply their key strikers could be the key impediment to qualification; defensively they are solid evident in their South American campaign. The Socceroos will enter this group with nothing to lose. The squad is filled with domestic league players as well as players plying their trade in European leagues. The EPL and SPL representatives will need to set the tone for others to follow. Tom Rogic, Miles Jedinak, Matt Ryan have impressed with their clubs and need to show the same form in this tournament. Aaron Mooy needs to be the play maker for this side and his performances will be an excellent gauge of how this side fare. The squad depth is a concern particularly defensively if suspension issues arise in the first two fixtures but expect Australia to provide pool opponents with plenty of issues in physicality and work rate. Tim Cahill’s cameos to nick a goal may be required once or twice in this tournament. Australia are the underdogs in this group but there is an upset result in this group of players; not enough to advance but may dash another side’s hopes of second round progression. Group B. The battle of Iberia and then you add Morocco and Iran to the mix, hoping beyond hope that they can pull off an unlikely upset. Hawkeye Sidekick reflects on a group where the opening fixtures of the round could fundamentally change the course of the tournament. The opening fixture of this group for Portugal will determine realistically how far they will go in this tournament. A fixture against the old enemy Spain. A fixture where both teams will look to win and establish a decisive blow in the outcome of the group. The runner up of this group has a daunting task to overcome a quietly fancied Uruguay in the second round. The winner of the group, a potential date with Russia or Egypt. What fixture would you prefer? Portugal had an indifferent qualification campaign but got their act together at the end of the campaign to beat Switzerland comprehensively to secure automatic World Cup qualification. The squad is loaded with talent. Cristano Ronaldo will look to create and score for a side who have massive experience defensively and in midfield with the likes of Alves ,Pepe, Quaresma and Moutinho in the ranks. Bernardo Silva has the ability and potential to be one of the stars of this tournament. The Manchester City midfielder / forward passing range and potency in front of goal will be a huge asset for Portugal to supplement the attacking workload from Ronaldo. How will Portugal setup though for Friday’s opening fixture against Spain? I hope that they do not go into their defensive shell and look to counter attack with the attacking talent at their disposal but I suspect they will go with prototype park the bus against Spain and ultimately loss to finish second. Julen Lopetegui has being quick to decide his future as he was announced as Real Madrid manager for next season today. The managerial announcement will surely have caused a stir in the squad particularly among the Catalan players. Unity in the camp is going to be the key for Spain to succeed in this tournament; any discontent in the camp and this tournament is over before it starts. The squad on paper is exceptional. From David De Gea in goals to Diego Costa upfront, there is a wealth of talent and depth in the squad to cover multiple positions. The lack of goals in recent warm-up games is a concern but it was not as if Spain were not creating good attacking chances? Iniesta and Busquets in the heart of the Spanish midfield will dictate tempo and provide defensive stability respectively. Costa in attack will irritate defenders to the brink and will punish any lapses in concentration. David Silva’s play making and runs from deep will pose opponents in this group massive issues. The first fixture against Portugal will be the decisive fixture; a cagey encounter beckons provided no early goals are scored. Both teams will look to perform from minute one but there will be a bit of ring rust with the start of the tournament. Spain are the team to beat in this group; their qualification campaign was impressive too with their performance at home to Italy very impressive. Spain to top the pool and avoid Suarez and Godin. An interesting outfit to evaluate; undoubted talent with the likes of Benatia and Hakimi in the defensive ranks but I am looking for an attacking outlet to cause problems for the two big European teams. I am struggling. El Kaabi is an unknown attacking quantity and there does not appear to be goals flourishing in the ranks. Herve Renard quite frankly has his work cut out for him in this group and can only see an early exit for the North African nation whose fans will bring color, atmosphere to their fixtures. Carlos Queiroz like Herve Renard will look to be defensively solid and look to launch counter attacks against their other group rivals. A daunting task given a look at the squad depth. Azmoun and Ghoochannejhad will provide the attacking threat for the Iranians. The worry is the other end of the pitch, not sure if the players in the goalkeeping and defensive ranks have either the experience or caliber to compete in this group. When you consider Ronaldo or Diego Costa against Iran, you suddenly start to feel my concerns for the Iranians. A result perhaps against Morocco is the objective but no hope of qualification for Iran. Queiroz will look to roam for pastures new immediately after the tournament. Italy, The Netherlands, Republic of Ireland and USA may not be at the big dance but it would not be this blog’s style without doing a proper review of the upcoming FIFA World Cup Russia 2018. This is the opening preview salvo will focus on the opening group (Group A) and the host nation have not done too badly in the draw. Russia come into this tournament needing to answer questions on their form and their ability to create from an attacking perspective. Their preparations for the tournament have being less than ideal with a couple of notable underwhelming performances. An opening game against a Saudi Arabia who on paper offer quite less going forward should present a good opportunity for Russia to score a couple of goals and gain confidence. Russia to look to counter-attack at every given opportunity so defensively, the hosts will need to be on point. Akinfeev is a vastly experienced keeper with over one hundred caps, quality shot stopper but his ability on crosses will be thoroughly tested. The defensive shape of the side will be led and organized by the likes of Ignashevich. Smolov and Dzyuba will provide the attacking threat but need midfield quality in the form of Zhirkov to come to the fore. If they cannot produce a convincing performance against Saudi Arabia in their opening game, then this group could prove problematic but think they will just about qualify to the last sixteen where that will be that. Juan Antonio Pizzi is only recently appointed, his two predecessors fired in double quick time. The majority of the squad play their football domestically in Al-Alhi or Al-Hilal. Given the unrest in management issues, how will the side setup in this tournament? The attacking onus will fall on the players who ply their trade in La Liga. Al-Dawsari and Al-Muwallad are technically gifted players who will look to create for the Middle East nation but defensively they look vulnerable given the level of competition that the squad play at domestically and even from an international perspective. Saudi Arabia will look to entice Russia out of their counter-attacking shell in the opening game; this is the key fixture for the Saudis to set the tone for the rest of the tournament. A heavy defeat and who knows if Pizzi will be leading the team for the second round of games? A potential point against Egypt is optimistic, more realistic is three losses and an early flight home. It is amazing to think that Egypt’s last World Cup appearance was in 1990. Egypt will not lack for physicality, fitness and quality in their ranks. Hector Cuper is a shrewd tactician and will hope that Mohammed Salah is back to full fitness to provide a serious attacking threat upfront. If the forward is, then Egypt are a massive live threat as the side have the defensive and midfield nous to cause problems for the other sides in the group. Hegazi in the heart of the defense needs to provide organization and keep his colleagues focused. Egypt defensively at times are prone to the lapse in concentration seen in their recent loss to Belgium in a warm-up contest. An even contest was blown open by two quick fire goals from Belgium. Fitness concerns abound on Elneny too, the central midfielder can provide stability for Egypt defensively. Fitness is the keyword for this Egyptian squad. If everyone is on top form, they can spring an upset against Russia and beat Saudi Arabia but lack of game time and cohesion could be their undoing. Early opening round exit due to these factors is the hunch. A proverbial dark horse in this tournament. A nice opening group to settle into the tournament. Massive quality throughout a squad which is vastly experienced. Muslera is an accomplished net minder and his defensive cover boosts the likes of Godin and Gimenez. A notoriously tough team to break down defensively and then you have the sublime attacking threats in attack. Suarez and Cavani provided they receive adequate service out wide have the ability to decide games with moments of brilliance. They are the form side in this group; they should win the group with minimum fuss and look to rest their front line starters before the end of this competition phase. Saudi Arabia, thanks for the coming but you are gone before a ball is kicked. Uruguay will top the group and it is then a battle between Russia and Egypt for the second spot in the group. Russia as host nation pip Egypt who will rue fitness issues for the lack of progression in this tournament.